In June, 2013, I'll be exhibiting a show of new cut paper works at Gallery 135, including a collaborative portrait series with photographer Christian Columbres. At the center of these pieces comes "Intersect," an 5.4' x 3.4' x 8.4' suspended paper installation. Two isosceles tetrahedron shapes will hang suspended in mid air, intersecting at the center point. 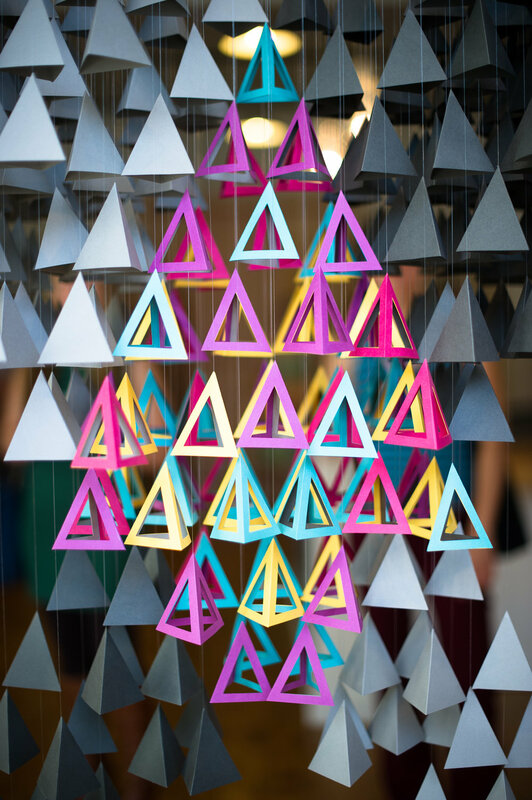 These shapes are made up of over 1,850 individually suspended paper pyramids. Like two people crossing paths in life, these shapes independent of one another, will be represented by two different shades of gray. At the point of intersection, a kaleidoscope of color will emerge, symbolizing a coalescence of the two forms. These two energies forever alter one another. The lessons and memories remain, while the point of merger, the experience of meeting, is impermanent and the journey continues.